A wonderful picture book collection of five well-loved stories introducing young children to the magical world of fairy tales. Each story is brought to life with evocative, colourful illustrations and a very simple text. Includes the classic tales Little Red Riding Hood, Goldilocks, Three Little Pigs, The Frog Prince and Twelve Dancing Princesses. Perfect for reading aloud with a parent or for children to read by themselves. 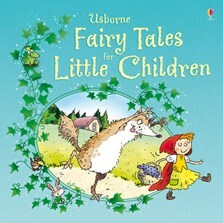 This book is a true delight with both stories and pictures packed with humour without tampering with the original tales.